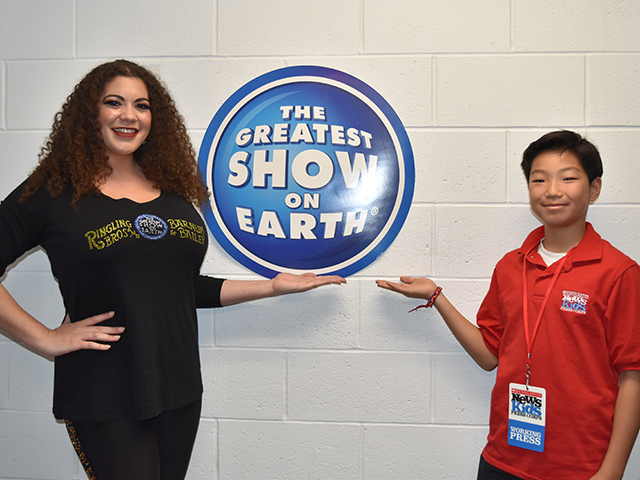 “The Greatest Show On Earth” Closes | Kid Reporters' Notebook | Scholastic Inc.
Click below to see Stone’s interviews with circus performers. Stone with Kristen Michelle Wilson, the first-ever female ringmaster for Ringling Bros. The circus staged by Ringling Bros. and Barnum & Bailey has dazzled kids in the United States for generations. Now, the circus is closing. The final curtain will come down on “the Greatest Show on Earth” in May. Last year, Ringling Bros. retired its elephants because of criticism from animal rights groups. The elephants are now kept and cared for at the Ringling Bros. Center for Elephant Conservation. After the elephants left the circus, ticket sales dropped sharply. This and rising operating costs made the business difficult to sustain. On April 14, the circus came to the DCU Center in Worcester, Massachusetts, for the last time. There, I got a chance to talk with some of the performers. “Take as many opportunities as you can to perform, and get in front of an audience,” said Matthew Lish when asked for advice for aspiring performers. A juggler in the circus’s Clown Alley, Lish is also an engineering student at Hofstra University.